I have one general rule when it comes to writing this weekly sports column: When Auxiliary Bishop Ray Chappetto speaks, you listen. During my time writing this column, Bishop Chappetto, who also serves as the pastor at St. Kevin’s, Flushing, has provided me with great story ideas that I’ve certainly enjoyed writing and that I hope you’ve all enjoyed reading. There was the story of how he became a Brooklyn Dodgers fan during the 1955 World Series – all because he got his tonsils out and was able to watch the day games while he was absent from school. There was the story of his younger brother Richie, who on April 19, 2013 completed every die-hard baseball fan’s dream of visiting all 30 MLB cities – with Toronto being the final stop on the journey. And last fall, there was the story of his uncle Peter, who was a sports legend on the streets of Astoria before valiantly fighting for his country during World War II. Chappetto Square near the RFK Bridge is named in his honor. So when Bishop Chappetto mailed me a packet of newspaper clippings about a year ago, I knew I was in store for another gem. The clippings highlighted the history behind the sale of Ebbets Field, the Diocese of Brooklyn’s former baseball paradise located at Bedford Avenue and Sullivan Place in what is today considered Crown Heights. As a baseball history buff, I was fascinated by what I discovered from these clippings and follow-up research. During the construction of Ebbets Field, the park’s namesake Charles Ebbets ran out of cash in 1912. To recoup some of his losses, he sold a half-interest of $100,000 cash to brothers Stephen and Edward McKeever. Steve McKeever played baseball at Assumption parish school, Brooklyn Heights, and St. James Catholic School, Downtown Brooklyn. He was a second baseman and served as team captain. Ebbets passed away on April 18, 1925. Two weeks later, Edward McKeever died of pneumonia after catching a cold at Ebbets’ funeral. At that point, Steve McKeever was prepared to purchase the other half of the ball field’s stock from Ebbets’ heirs. 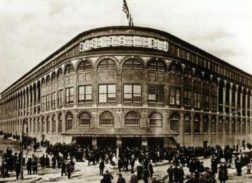 However, the Ebbets family held out for what they deemed a fair price for the ballpark, which at the time of Ebbets’ death was the most valuable property in baseball. Following the 1932 season, Manhattan attorney Frank B. York resigned as president of the Dodgers to devote more time to his legal practice. That paved the way for the then-77-year-old McKeever to be unanimously elected as team president and chairman of the ball club’s board of directors. The sale of the park was still in progress. According to a Dec. 8, 1936 article in the New York Daily Mirror, lawyers and opposing factions were wrangling over Ebbets’ half interest in the Dodgers’ home, while the family struggled to make ends meet. “I’m not going to stand by and see the Ebbets heirs tricked out of their inheritance,” said May Ebbets Cadore, who worked as a scrubwoman at the park just to get by. The quoted sale price of the ballpark was $750,000. Branch Rickey and Walter O’Malley each purchased a quarter ownership, while Pfizer Chemical general manager John L. Smith also purchased a quarter share. McKeever retained the final quarter. Through my research of this sale, I came across a number of interesting court documents pertaining to the history of the Brooklyn Dodgers. Extensive paperwork detailed the purchases of the team’s minor-league affiliates in Reading, Pa., Elmira, N.Y., and Montreal. The Montreal Royals soon became home to the great Jackie Robinson, who played for the team before being called upon to break baseball’s color barrier with the Dodgers on April 15, 1947. I also discovered the Dodgers’ player contract form. Unlike free agency in today’s game, players had to agree with whatever the owner was willing to pay them. What’s more is that the players themselves had to place a deposit on their own uniforms. Just last fall, current Los Angeles Dodgers ace Clayton Kershaw swapped out his jersey every three innings during the same World Series game to battle 103-degree heat. How times have changed! Of all the court records I perused, I was most intrigued by the countless lawsuits filed against the team in the Brooklyn Supreme Court. Fans were certainly not timid about exercising their right to sue the club. In one instance, a patron sued the team after being injured during a mad rush to the stadium’s exit – citing he was knocked down and had his hand caught in one of the seats while also experiencing pain in his ankle. The case was eventually dismissed, with the conclusion stating that the Dodgers were not liable for the fan’s unfortunate injury. Similarly, another fan was struck in the head by a batted ball and filed suit. Again, it was ruled that the Dodgers were not responsible. I could go on and on about all the historical items I found through my research. Hopefully though I was able to give you a glimpse into the borough’s baseball past. Next time you’re around the Ebbets Field Apartments in Crown Heights, check out the sign across the street that says, “This is the former site of Ebbets Field.” The wall stands in what would have been the ballpark’s center field. And when you’re there, soak in the rich history of the Brooklyn Dodgers – “Dem Bums” – and the great baseball lore that took place right here in the Diocese of Brooklyn. Thanks again for the tip, Bishop Ray! The Tablet needs a lot more of these types of historical features on the Diocese.